There may be some limited standing room only tickets available once the show starts at 8 pm for $85.50. In celebration of its 50th anniversary, Arhoolie Records throws the party of a lifetime, with panels (see link to Arhoolie's website for time & locations), discussions, fantastic regional foods, a "second line" parade Saturday 4 pm with the Tremé Brass Band, plus three amazing concerts with proceeds benefiting the Arhoolie Foundation. The celebration kicks off tonight with a truly amazing concert featuring slide guitarist extraordinaire Ry Cooder, a roof-raising Tex Mex Fiesta with Santiago Jimenez, Jr. and La Familia Peña-Govea, Los Cenzontles, Any Old Time String Band, BeauSoleil Trio w/ Michael Doucet, and Laurie Lewis & Tom Rozum, emceed by the illustrious Nick Spitzer, host of the popular public radio program American Routes. 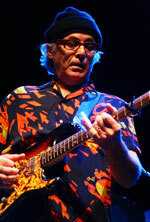 With an instantly recognizable style, slide guitar master and multi-Grammy winner Ry Cooder has created an impressive and wide-ranging body of work, encompassing dust bowl folk, rock, blues, Tex-Mex, soul, and collaborations with traditional musicians worldwide, from Ibrahim Ferrer and the Buena Vista Social Club to Ali Farka Touré of Mali. A major force in Tex-Mex border music, Santiago Jiminez, Jr. is a singer and accordion virtuoso of the first rank, as well as a National Endowment for the Arts National Heritage Fellow. Following in the footsteps of his father, one of the great pioneers of conjunto (social music of Mexico and south Texas) accordion style, Santiago Jr. also incorporates touches of the more modern approach made popular by his brother Flaco. His music represents the experience of the Mexican-American people of south Texas, and is celebrated for having helped shape a society that remains strong in its identity and cultural presence. Led by Miguel Govea, La Familia Peña-Govea presents traditional Tex-Mex and Colombian music featuring punchy accordion leads and driving rhythms. Based in SF's Mission district, the band also features fiddler Susan Peña and multi-instrumentalist/vocalist/composer daughters Rene and Cecilia. One of the most popular old-time bands in California during the 1970s and '80s, any Old Time String Band plays an adventurous mixture of traditional fiddle tunes, old blues, string band songs, Cajun music, and even a bit of string band jazz. The pioneering all-woman band combines contagious high spirits with top-notch musicianship from Suzy Thompson, Kate Brislin, Sue Draheim, and Genny Haley. Lauded by New Orleans R&B god Allen Toussaint for playing "music that's honest to the bone," Multiple Grammy winning Cajun band BeauSoleil Trio w/ Michael Doucet features Michael on violin, guitar, accordion, mandolin, and vocals, along with David Doucet on guitar, and Mitch Reed on fiddle and bass. Laurie Lewis & Tom Rozum play music that's simply beautiful. Laurie's songwriting, fiddling, and crystal-clear singing have brought her national recognition, a Grammy, and two International Bluegrass Music Association Awards for Female Vocalist of the Year. Tom adds his skilled multi-instrumental and vocal talents. ...and be sure not to miss the grand finale jam! Whew!